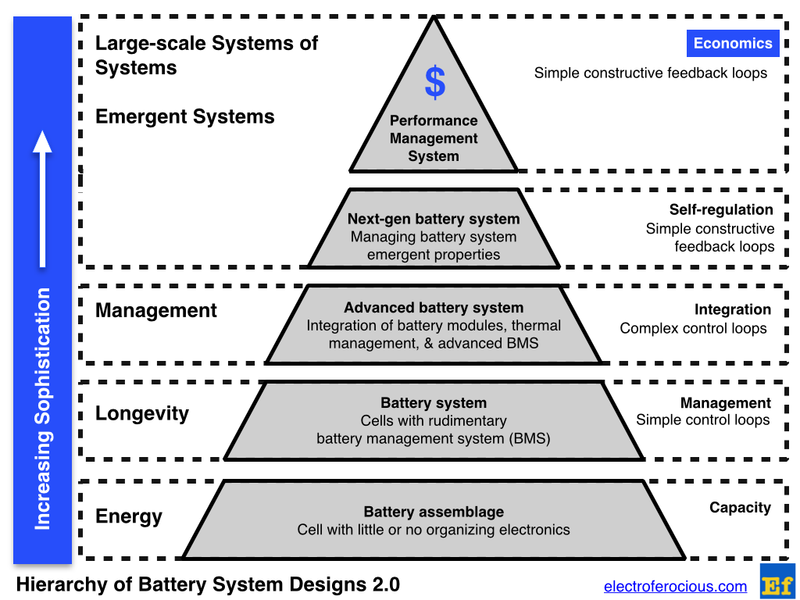 In early 2014 I published a work-in-progress called the Hierarchy of Battery System Design. It was an attempt to codify the distinguishing characteristics between battery designs/philosophies. These drive the subsequent engineering practices and economics. Inexperience & manufacturing are two roadblocks to #energystorage far ahead of #battery chemistry. First, inexperience must be overcome in order to create battery systems with even rudimentary control systems. Then, manufacturing constraints such as architecture, process, equipment, yield, etc. must be transformed in order for economically viable battery systems to be developed. Please let me know what you think about this new hierarchy and read more about Level 1, Level 2, Level 3, Level 4, and Level 5 systems.